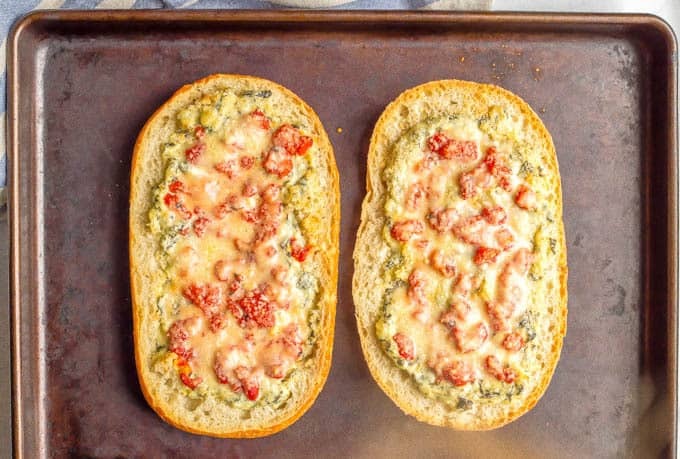 Spinach artichoke stuffed French bread is a super easy recipe that’s always a crowd pleaser! 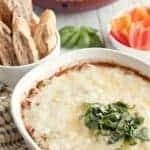 Spinach artichoke dip is layered over French bread, topped with cheese and then baked until bubbly to make an irresistible appetizer for game day or any party! I’m a little here, there and everywhere this week. We also finally finished reading the first Harry Potter book with the kids earlier this week and we are planning a movie night this weekend that I’m so excited about! But on to the FOOD already, right?! 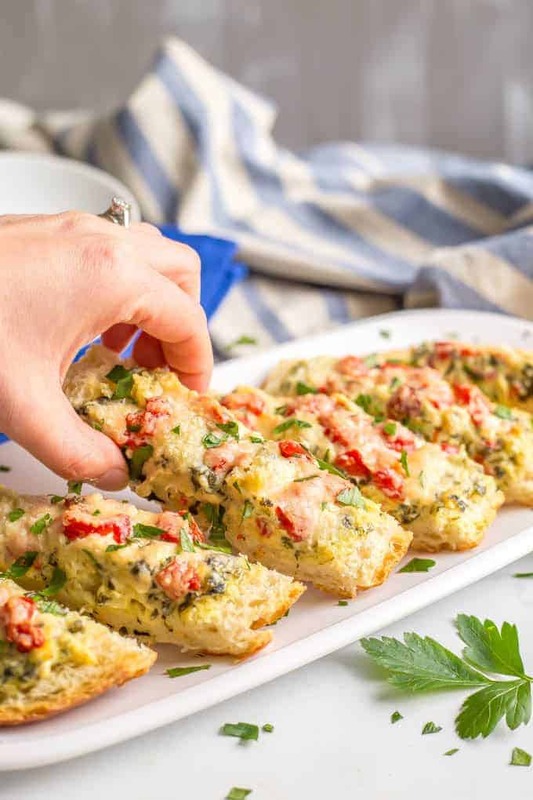 Today’s recipe for spinach artichoke stuffed French bread is ridiculously easy because it uses just two ingredients: a loaf of French bread and La Terra Fina’s Spinach Artichoke & Parmesan Dip & Spread. So you can literally swing by the store for those two things and be all set with a delicious appetizer! Now, of course, it’s me, so I added some TOPPINGS! These are optional but recommended. I’ve also included notes below so you can switch them up or add even more. Make it yours! 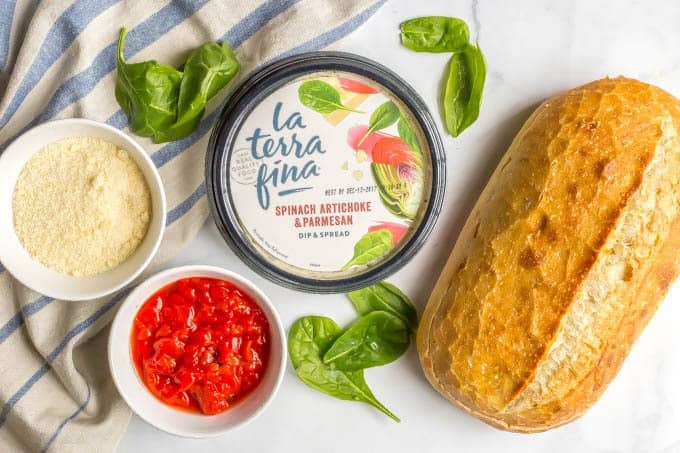 And I’m so happy to be sharing another recipe in partnership with La Terra Fina because their dips and spreads are so good! 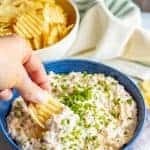 I can’t even pick a favorite because they have so many great flavors – the basics but also some more unusual ones like Lemon Pepper & Asiago. 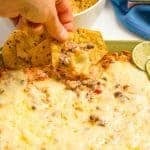 And we’re stuffing it into some bread and baking it off to make the perfect party appetizer – particularly for game day and the upcoming BIG GAME! Baking the bread like this means the outer edges, which aren’t covered, get browned and super crusty, while the inside is more tender. And headed back for seconds and thirds as you cheer on your team! I use a French loaf for this recipe, which is not the same as a really long French baguette. You can substitute a different bread here but you may need to adjust the baking time. You can use store-bought roasted red peppers for this recipe (just make sure to drain them very well) or you can roast your own. I’ve included notes in the recipe card. Feel free to add your favorite toppings here! Chopped olives, breadcrumbs, diced tomatoes, and even some cooked, crumbled bacon would all be delicious. I use chopped fresh parsley (which I have on hand from my garden), but you could substitute fresh basil if you prefer. 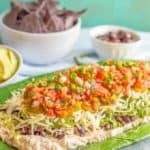 Wherever your team stands in the rankings, I hope you plan some football watching fun and gather your friends together to share this easy stuffed French bread appetizer. 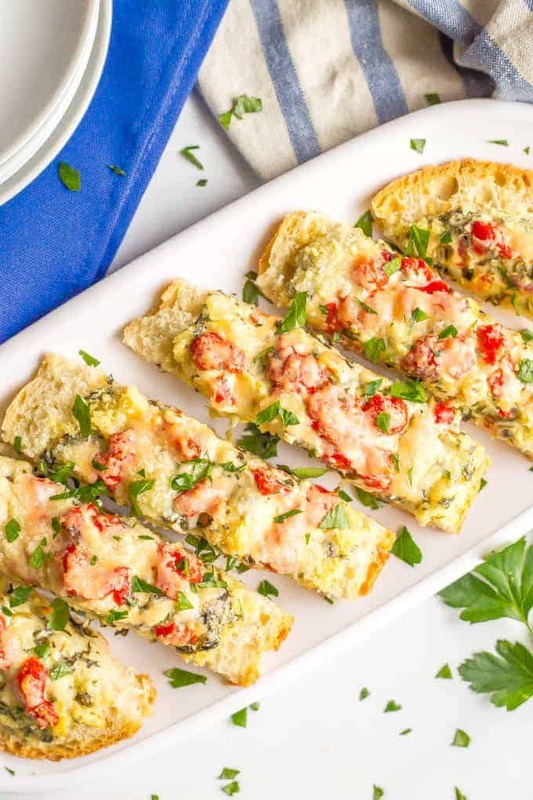 Spinach artichoke stuffed French bread is a super easy recipe that’s always a crowd pleaser! 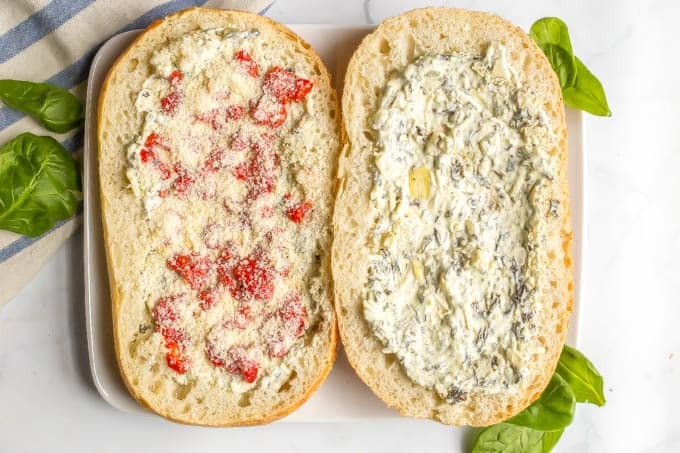 Divide the dip evenly between the two bread loaves. Add chopped bell pepper and Parmesan cheese. Bake at 350 for 20 minutes, until warm and cheese is melted. Sprinkle the bread with chopped fresh parsley, slice and serve immediately. You can use store-bought roasted red peppers for this recipe (just make sure to drain them very well) or you can roast your own. See below for details. Love spicy food? 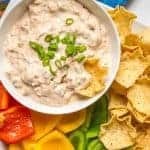 You can mix 1/4 teaspoon cayenne pepper into the dip or sprinkle it on top with the other toppings. You could also use red pepper flakes. Or you could serve this with a drizzle of sriracha. To roast your own red pepper, preheat the oven to 450. Cut the bell pepper in half, remove seeds and membranes and place the cut side down on a foil-lined baking sheet. Drizzle with olive oil - about a teaspoon - and roast at 450 for 15-20 minutes, until the pepper halves are charred and wrinkled. Transfer pepper to a small bowl and cover with plastic wrap to let it steam. When cool enough to handle, rub the skins of the pepper to remove the charred bits. Then chop and proceed. Spinach & artichoke….a match made in heaven! 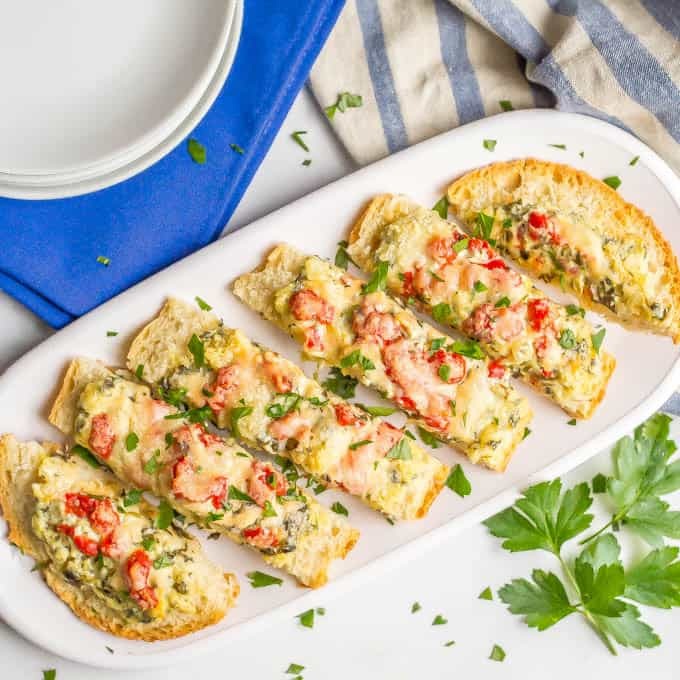 these stuffed french breads sound so amazing, like I could eat a ton of these, where I live I can´t get La Terra Fina, but I will try to make it all from scratch, thank you for the recipe and inspiration! Okay, genius. 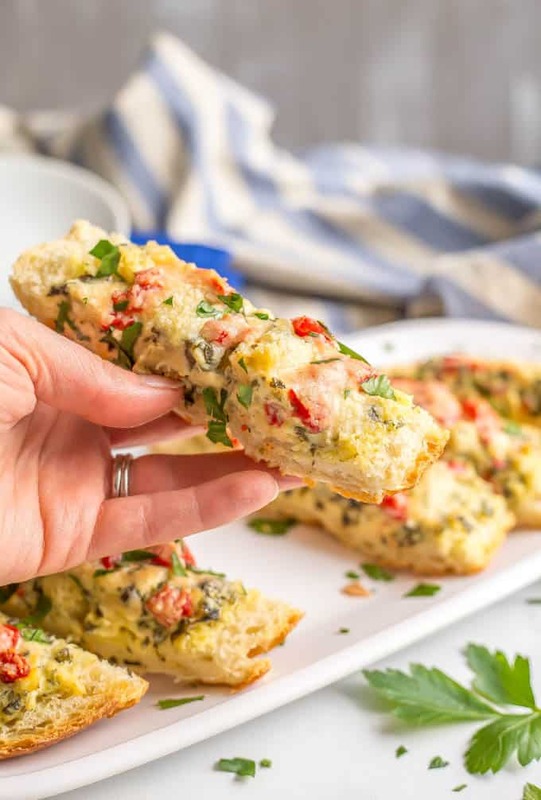 Bread is good, but bread stuffed with spinach artichoke deliciousness? Magical. Haha, thanks Karly! 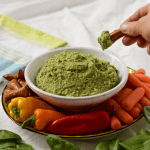 It’s such a yummy appetizer and such a hit at parties!